As reimbursement for imaging (like many other physician services) under the current fee-for-service system has been cut over and over again, your Economics Commission has heard the message loud and clear that we need to help members find a way forward. The somewhat overused phrase “volume to value” does provide an overarching principle, but we need to find concrete ways to help radiologists continue to help their patients, practice the specialty they love and feed their families. The cultural change that we need to make as a profession is embodied in the Imaging 3.0 campaign. The specific payment models for the future are more elusive. 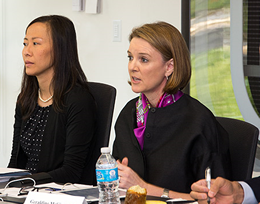 On Monday, April 14, we convened a meeting of policy experts, radiology thought leaders and, most importantly, radiologists who are leading change in their own practices, to review our activities to date on developing new payment models. Our goals were several fold and we learned a lot. It turns out that most specialty groups are struggling to figure out the best way to succeed in the new world of bundled payments and ACOs and we may, in fact, be ahead of many as evidenced by the calls the Neiman Health Policy Institute has been getting from other professional organizations asking for ideas. We were reminded that while change may be mandated centrally, it is happening most effectively at the local level. And the more we can tap into our collective experience, the better. We recognized, yet again, that we work with incredibly smart and dedicated business managers and administrators and that our team effort will be critical for our success. We’ll be reporting more specifically on the results of our discussions in the near future, but in a nutshell: we are on the right track, there’s no magic bullet we haven’t thought of and our Imaging 3.0 commitment to our patients and our profession will be our strength.